Are you looking for a way to create an environment of engagement to positively impact the way customers feel about your organization? David Peterson is a well-recognized eBanking pioneer, who has authored a powerful new book that focuses on strategic leadership and effective decision making in a crisis. His keynote address on Grounded, enthralls audiences with captivating true stories, including the tale of his own shipwreck in the Caribbean! David understands that leadership and effective decision-making are not made in a crisis. And they are not inherently born within us. They are cultivated over time and through our experiences. But regardless of where we are in life, the positive traits that make us grounded can be enhanced. And the negative traits that leave us grounded can be minimized. 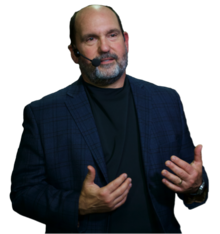 His engaging and fun speaking style is highly rated by attendees, because he is a master storyteller. David has the unique talent to engage with every person in the room, and the financial services or Grounded presentations can be tailored to the individual needs of your organization. David’s blend of fast-paced, strategically relevant content is delivered in a fun and engaging style that leaves participants thinking with a smile. About David Peterson: A dynamic and engaging presenter, David has performed thousands of presentations and led dozens of strategic planning sessions and workshops for both financial institutions and FI service providers. He has been a featured keynote speaker for numerous associations, banking schools, and industry trade groups, including ICBA, NACHA, BAI, and GSBC as well as numerous state and regional associations across the country. As a seasoned entrepreneur and thought leader, he is frequently published in regional and national publications on a wide range of electronic banking, virtual branch, payments and strategic thinking topics. David serves as Chief Strategic Officer of i7strategies, an independent strategic planning and consulting firm for financial services and electronic payment initiatives. He was also the original founder of Goldleaf Technologies, a leading provider of electronic payments software and online banking services to independent financial institutions, where he was instrumental in establishing electronic banking and payment systems for commercial banks both in the U.S. as well as throughout Latin America and the Caribbean. David previously served as Executive Vice President for Q2, a virtual branch software provider where he focused on enterprise-wide strategic initiatives, product direction and executive consulting. He remains active in U.S. payment virtual banking initiatives, serving on the Boards of PaymentsFirst, a regional payment association based in Atlanta Georgia that serves over 350 members and ArgosRisk, a systemic risk tracking service provider, based in Minneapolis Minnesota.